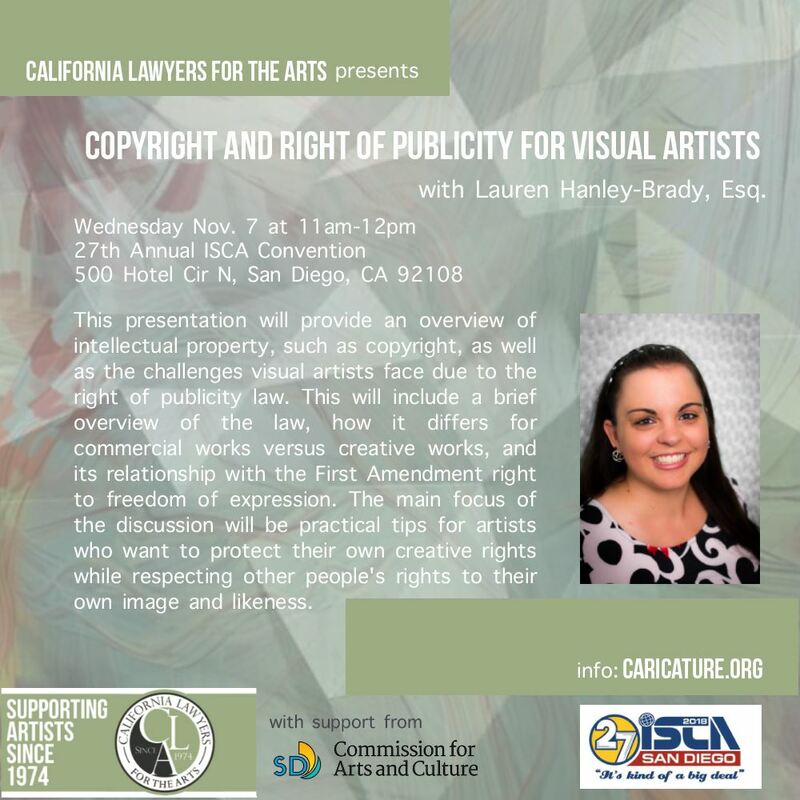 Copyright and Right of Publicity for Visual Artists with Lauren Hanley-Brady, Esq. This presentation will provide an overview of intellectual property, such as copyright, as well as the challenges visual artists face due to the right of publicity law. This will include a brief overview of the law, how it differs for commercial works versus creative works, and its relationship with the First Amendment right to freedom of expression. The main focus of the discussion will be practical tips for artists who want to protect their own creative rights while respecting other people's rights to their own image and likeness. Speaker: Lauren Hanley-Brady is an associate attorney at Global Legal Law Firm, a high stakes business litigation firm based in Solana Beach, California. Before working in litigation, Lauren worked as a solo attorney providing transactional services (i.e. drafting contracts) and counseling on intellectual property matters. A San Diego native, Lauren majored in film production at SDSU, where she was an editor and producer, and she minored in creative writing--a passion she continues to pursue to this day.